The IOGEAR Wireless 4–Port USB Sharing Station has the capacity and compatibility to get any tech lover’s heart racing, but there are a few questions revolving around the actual efficiency of this new wireless USB hub. Furthermore, it begs the question: is it fast enough? It’s about time that a consumer electronics company realized that the need for streamlining the use of countless different cords in such a way. The IOGEAR USB hub (GUWIP204) is an awesome concept in that this wireless hub allows up to four USB devices to be used and shared wirelessly by any number of people in a home or small office at once. For example, families and co-worker can share a printer with scanning and faxing capabilities. Access a webcam from multiple computers, (allowing for your own security system) or transfer files from your flash drive to an external hard drive that’s set up in another room. There are three USB 2.0 ports on the back of the hub as well as one on the front. It also features an Ethernet port for expanded versatility. A wireless antenna is attached to allow for maximum distance, even beyond the average 16 foot distance from your hub. It’s enough to give some users a feeling of freedom from being bound by cables and corded devices for so long. However, there is one small caveat. The hub’s primary interface for devices is USB 2.0. While it may be great for now, it seems more prudent to invest in a backward compatible USB 3.0 that will act as a more future-proof hardware choice in the years to come. Consequently, is it even fast enough to support wireless, let alone Ethernet? If it has the stamina to support speedy, large data transfers, it will in fact be worth the $100 price tag. For those users who want to go wireless or bust and are willing to give it a shot, it will undoubtedly expand the function of home offices, small businesses and data demands of families. 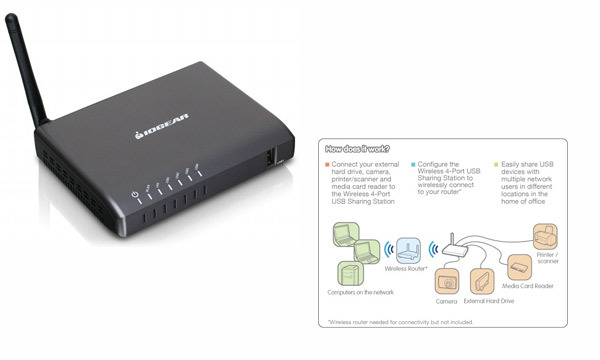 Would you go wireless with the IOGEAR 4–Port USB Sharing Station? Share your opinion with us. This entry was posted in Articles, IOGEAR, IOGEAR USB Hub GUWIP204, USB 3.0, USB Devices, USB Gadgets, Wireless USB Hub and tagged IOGEAR, IOGEAR USB Hub GUWIP204, IOGEAR Wireless 4 Port USB Sharing Station, IOGEAR Wireless USB Hub, IOGEAR Wireless USB Hub GUWIP204, USB Sharing 4-port, wireless USB hub. Bookmark the permalink. How can I obtain the drivers for a Bluetooth 2.1 ? My operating system is Windows Vista 32(bit) Bluetooth S/N OU08usc2j06535. MODEL GBW421WM.When I purchased it, came in with a mini_disc with a WARNING note, telling me no to insert the mini disk in my DVD Drive. they tell me that download the drivers from the Internet. I have tried, and some how I can’t get the drivers. Will you please Help?